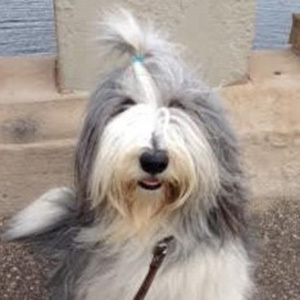 Oliver is a Bearded Collie (Scottish Sheepdog) with boundless energy and a quick wit. His handler Carolyn says sometimes he can hardly control his joy, twirling upwards when he sees people he knows and barking like mad. He is naturally energetic, athletic, and agile. When he wants to go outside (which is often), he brings Carolyn the shoe he thinks she should wear for their walk. One shoe. Sometimes, he welcomes guests to his home by pre-moistening their shoes – to help them fit better. Oliver loves everybody, but has not had the chance to fully explore the animal world close-up. He hasn’t met an elephant or a tiger, but watches for the local bunnies and squirrels in order to greet them. He isn’t fond of loud wheely things like rollerblades and skateboards. Oliver loves to go to work as a North Star Therapy Animals therapy dog, bringing happiness to people of all ages. When he wears his harness and special scarf and leash, he hops in the car and is ready to go! He likes visiting people who like to pet him. He likes short visits better than long visits, and he gets hot and restless if he has to stay too long in one place. Oliver has important work – even at home. Every morning after breakfast, Oliver brings the newspaper into the kitchen and presents it to Carolyn. If he’s able to bring in the paper without tearing it, he gets a treat. Oliver would trade just about anything for a treat.